Who would have ever thought that you would be using prime numbers to amaze an audience with a magic trick? But that is the hallmark of the true magician, the ability to use anything and everything to amaze, which you will do with this Prime Pairs card trick. Cutting a deck of cards in half the magician passes one packet to one spectator and the second to another. He asks them to take a random card out of the deck and look at it, and then pass it to the other person. Each person places the card on top of their packet, and then shuffles it. The two are combined, and the magician quickly scans through the deck and selects the two chosen cards. The deck of cards is divided into two groups - one set of prime numbers, and one set of non prime. Exchanging the cards makes them stand out if you know what to look for. Only a regular deck of playing cards and basic grasp of prime numbers. This trick does take some prep, and might be a trick you want to lead with. Divide up the deck into all the prime numbers in one stack (2, 3, 5, 7, J, K,A) and the non prime in the other (4, 6, 8, 9, 10, Q). You may wish to bend a key card slightly between them so you can quickly divide the two groups in front of an audience. 1)	The magician pulls out a deck of cards and explains that, using mysterious magical secrets taught to him by his master, he will be able to divine not one spectator's freely chosen card, but two. 2)	Two volunteers are brought forward, and each given one half of the deck. 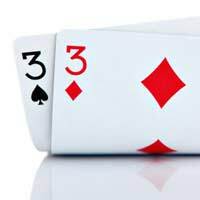 The magician hands the prime number set to one, and the non prime number set to the other, and invites both spectators to shuffle and cut to their heart's content. 3)	After they are done, each person looks at one card, removing it from the deck, and shows it to the audience. Each then exchange their cards, placing them on the top of their respective decks. 4)	They are asked to shuffle again, and then hand the two packets to the magician, who combines them together. The magician may then give the deck a few quick cuts. 5)	The magician fans through the deck. The two cards should be out of place. As he fans through the 2's, 4's, 8's, etc, he will come across a group from the primes, say a 3, and do the same when he fans through the prime group. He then retrieves the cards and shows that his powers are still intact. When the cards are in the box it can be tough to split them evenly, so take the top card from the bottom half and bend it slightly in the middle, which should give you a quick break to divide the deck.